Picture a sky blanketed with birds this fall and winter erupting into flight, filling the air with calls and the sound of thousands of wings beating together. For a fun, inexpensive way to find out more about birds, experience a birding festival at one of your National Wildlife Refuges or other federal lands. Fall (September through December): Eastern Shore Birding and Wildlife Festival, Virginia (October), Ridgefield Birdfest and Bluegrass, Washington (October), Wings over Water Festival, North Carolina (October), Ding Darling Days (October),Assateague Island Waterfowl Weekend, Virginia (November), Festival of the Cranes, New Mexico (November), Rio Grande Valley Birding Festival, Texas (November). Winter (January through March): Festival of the Cranes, Alabama (January), Space Coast Birding and Wildlife Festival, Florida (January), Winter Wings Bird Festival, Oregon (February), San Diego Bird Festival, California (February/March). The Festival of the Cranes will be at Wheeler National Wildlife Refuge, southeast of Decatur. See thousands of wintering sandhill cranes as well as whooping cranes and white pelicans. Considered the easternmost refuge in the Mississippi Flyway, it attracts thousands of wintering waterfowl each year and is home to Alabama’s largest wintering duck population. During the festival enjoy refuge tours, birding workshops, nature walks, live raptors and kids’ activities. Did you know that the refuge is just one of many sites on the Central Loop of the North Alabama Birding Trail? The San Diego Bird Festival includes workshops, an optics expo, pelagic (open sea) birding, art and cultural activities and field trips to mountain, shore, desert and wetlands that include three coastal San Diego Bay area national wildlife refuges. The refuges protect a rich diversity of endangered, threatened, migratory, and native species and their habitats in the midst of a highly urban coastal environment at the south end of San Diego Bay. Look at the 2015 checklist (PDF) to build your enthusiasm! Save the date for 26th annual “Ding” Darling Days. Enjoy a week of fun-filled and informative programs, bird walks, tours, paddling and family activities at J.N. Ding Darling National Wildlife Refuge in Sanibel. Look for anhingas and try to spot the refuge's Big 5 bird species during your visit. Download the free Ding Darling game app and play the Wildlife Drive trivia game! Be sure to share field tips, photos and record the birds you see. Eastern Florida State College in Titusville hosts the annualSpace Coast Birding and Wildlife Festival, billed as one of the largest and best birding and wildlife festivals in the U.S. You’ll find festival trips and events at numerous sites in and around the Space Coast area including Merritt Island National Wildlife Refuge. Choose from a variety of activities to participate in including presentations, field trips, classroom and field workshops, exhibits and demonstrations. Attend the Festival of the Cranes and see wintering sandhill cranes and snow geese by the thousands. The festival is held at the Bosque del Apache National Wildlife Refuge outside of Socorro, approximately 1.5 hours from Albuquerque. Enjoy workshops, tours and other events at one of the most celebrated bird festivals in the country. The 57,331 acre (23,201 hectares) refuge straddles the Rio Grande River at the northern edge of the Chihuahuan desert. Use this 2015 festival brochure (PDF) to help you plan your visit then come enjoy the Land of Enchantment. Read this article about bird band #599-05468 on a crane with some serious frequent flyer miles and watch this video about cranes at Bosque. Head to the Wings over Water Festival this fall. Near the Outer Banks of North Carolina, this multi-day festival features field trips to five national wildlife refuges: Pea Island, Alligator River, Mattamuskeet, Pocosin Lakes andMackay Island National Wildlife Refuges. Also included: classroom programs, bird walks, paddling trips, and talks about wildlife photography and natural history. The Winter Wings Festival requires advance planning and it’s definitely worth it. Activities for everyone fill this four-day event in southern Oregon, near Klamath Falls. Birdwatchers, photographers and families will enjoy learning about nature during this event. During the festival, be sure to visit nearby Lower Klamath Wildlife Refuge, Tule Lake National Wildlife Refuge, orCrater Lake National Park and these birding hotspots (PDF) in the Klamath Basin to add to your birding life lists. See what’s in store for the 2016 festival program and events. Located in and around Harlingen, the Rio Grande Valley Birding Festival includes field trip destinations to Laguna Atascosa,Lower Rio Grande Valley and the Santa Ana National Wildlife Refuges. Events include lectures, workshops, birding trips and other guided tours. Buses and minivans at the South Texas Refuge Complex will support festival-goers. Look for the great kiskadee, green jay, Altamira oriole and plain chachalaca. The Chincoteague National Wildlife Refuge will offer guided walks, tours and other special events to mark the fall migration of waterfowl to the refuge. Some tours will be in areas normally closed to the public. The refuge provides habitat for greater snow geese and many other migratory birds. The refuge is on the Virginia end of Assateague Island and includes more than 14,000 acres (5666 hectares) of beach, dunes, marsh, and maritime forest. Head out to Cape Charles this fall for the Eastern Shore Birding and Wildlife Festival. The event features field trips to the Eastern Shore of Virginia and Fisherman Island National Wildlife Refuges. Nearby Kiptopeke State Parkwill also host several programs and offers camping in the park. The annual festival, along the lower Columbia River, offers guided bus tours, Audubon bird shows, live music, arts and crafts, and activities at the Cathlapotle Plankhouse, a full-scale replica of a Native American structure found in the old town of Cathlapotle. The 2015 festival will also celebrate the Ridgefield National Wildlife Refuge’s 50th anniversary and the completion of a new pedestrian universal-access bridge. Stellwagen Bank National Marine Sanctuary is one of the top whale watching destinations in the world. This 842-square-mile (638-square nautical-mile) protected area accounts for about 80 percent of the whale watching along the East Coast. One of the many whales you’ll find here is the humpback which returns every summer to feast on sand lance (a type of fish commonly called “sand eel”) and to teach their young how to hunt. Here you can see the newly restored Charles W. Morgan; the world’s only remaining wooden whaler, the last of an American whaling fleet and a National Historic Landmark. Built in 1841, the Morgan embarked on 37 multi-year voyages over a span of 80 years. Today the Morgan is docked at Mystic Seaport in Connecticut, is open to visitors and sails as an ambassador for all whales and for ocean conservation worldwide. Stellwagen Bank is one of 14 sites in the National Marine Sanctuary System in the United States. Stellwagen is located offshore at the mouth of Massachusetts Bay between Cape Ann and Cape Cod National Seashore. It is in the southwest corner of the Gulf of Maine and 25 miles east of Boston. The headquarters offices are located in Scituate, Massachusetts. Take a New England road trip or fly into Boston's Logan Airport to reach the sanctuary visitor centers. You’ll have to go on a boat ride to participate in sanctuary activities like whale watching, fishing and diving, which can be accessed from many nearby ports, including Provincetown, Plymouth, Gloucester and Boston. Experience close encounters with whales, respectfully and safely. NOAA partners with commercial whale watching companies participatingparticipating participating in the Whale Sense Program which recognizes companies committed to responsible whale watching practices. Shipwreck divers can explore more than 50 sites within the sanctuary. Check our Underwater Graveyard go list for more amazing places that feature our nation’s maritime history. Pack for changing New England weather. Summertime and fall are gorgeous here—but the weather can, at times, be unpredictable. Bring waterproof raingear and pack clothes that you can layer. Help protect the sanctuary by practicing good ocean etiquette. Use these tips for whale watching to help you enjoy your visit. Learn how to treat the ocean and how to interact with wildlife so we can protect this delicate ecosystem. The World Wildlife Fund identified Stellwagen as one of the top 10 whale watching sites in the world. During summer, humpback whales delight watchers with acrobatic displays, graceful dives and active feeding behaviors. You can see finbacks, the largest of the common local species and second largest animal on the planet regularly. While the humpback and finback are endangered species, the minke whale is more plentiful worldwide. The minke is hunted today by whaling nations. AMSOIL Synthetic Vehicular Natural Gas Engine Oil delivers superior protection and performance in vehicular and mobile natural gas engines calling for an API CF 15W-40 low-ash lubricant.AMSOIL Synthetic Vehicular Natural Gas Engine Oil is formulated specifically to meet the special requirements of natural gas fueled engines used in vehicles and mobile equipment. It delivers superior protection and performance in applications calling for a 15w-40 low-ash lubricant. Minimizes Deposits and Valve RecessionSynthetic Vehicular Natural Gas Engine Oil's low-ash formulation helps minimize valve stem and combustion chamber deposit formation. It is designed to reduce valve recession, a common problem with low-ash oils. Its balanced formula allows for a high total base number (TBN) to neutralize acids and protect against corrosion while meeting low ash requirements. Maintains ViscosityThe shear stable formula of Synthetic Vehicular Natural Gas Engine Oil offers maximum protection against viscosity loss while providing optimal service over a broad temperature range. It has inherently low volatility to reduce oil consumption and emissions, helping maintain serviceability of emissions equipment. Delivers Continuous ProtectionAMSOIL Synthetic Vehicular Natural Gas Engine Oil is a long life oil that has demonstrated extended drain interval capabilities when carefully monitored by an oil analysis program. When extending oil drain intervals, change the oil filter at the engine manufacturer's recommended interval. 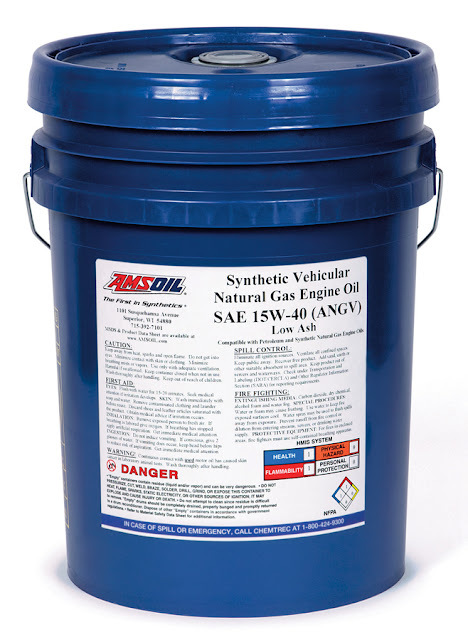 Mixing AMSOILAMSOIL Synthetic Vehicular Natural Gas Engine Oil is compatible with conventional petroleum oils and other synthetic lubricants; however, mixing AMSOIL with petroleum oil will not allow for the maximum protection and performance of the product. Engine oil additives or aftermarket products are not recommended for use with Synthetic Vehicular Natural Gas Engine Oil. A historic route that symbolizes the spirit of the American West. The nearly 2,000-mile (3,218 km) route passes through a variety of public and private lands. Visit trail traces, visitor centers, museums, hiking trails, historic structures and forts related to the Pony Express National Historic Trail. The trail crosses eight states following an impressive relay system established in 1860 to deliver mail in 10 days; unprecedented for the time. The trail marks the journey taken by dozens of young, svelte riders and hundreds of horses between St. Joseph, Missouri, and Sacramento, California. Although the Pony Express operated for only 19 months—April 1860 to November 1861—it remains a legendary chapter in American history. Auto tour routes and GIS interactive maps are available to chart a course across the Pony Express National Historic Trail. Stop by these 10 selected sites in Missouri, Kansas, Nebraska, Wyoming, Utah, Nevada and California to weave together significant places and relay stations along the route. Visit the Pony Express National Museum in St. Joseph, Missouri, where the first lone rider galloped out of the Pikes Peak Stables on April 3, 1860; and the B.F. Hastings Building in Old Sacramento, which was the western terminus of the overland Pony Express for most of its existence. The Pony Express National Historic Trail crosses many federal, state and private lands along the way offering countless camping and lodging options. Visit Recreation.gov to find a convenient location as you experience and discover what life must have been like for those young, tough riders of the West. The Pony Express Trail 500 and 100 Mile Endurance Race is held in western Utah in mid-October. This running race travels on dirt roads following portions of the original route and takes runners by several pony relay stations and stage line stops. In 1845, it took six months to get a message from the east coast of the United States to California. By the late 1850s nearly half a million people had migrated west and wanted to get up-to-date information across the country. To keep the mail moving quickly and steadily, the Pony Express established relay stations where riders would switch to fresh horses every 10 to 12 miles (16-19 km). They utilized existing stage stations on the eastern end of the route, but needed to build new stations in remote areas across the Great Basin. As the company was established, 400 to 500 mustang horses were purchased, 200 men were hired to manage the stations, and 80 riders signed on to begin the run of the Pony Express. "He rode a splendid horse that was born for a racer and fed and lodged like a gentleman; kept him at his utmost speed for ten miles, and then, as he came crashing up to the station where stood two men holding fast a fresh, impatient steed, the transfer of rider and mail-bag was made in the twinkling of an eye, and away flew the eager pair and were out of sight before the spectator could get hardly the ghost of a look." 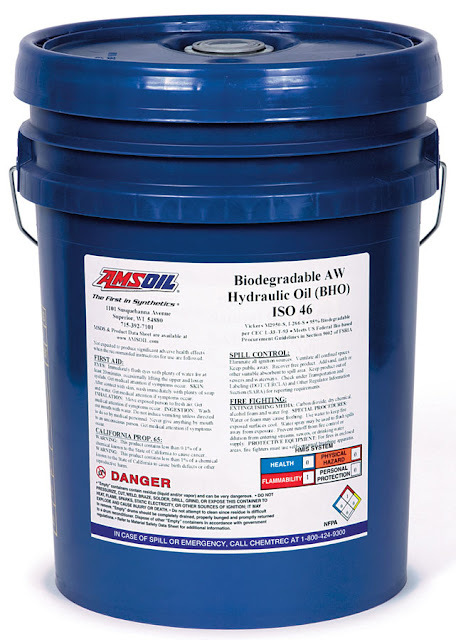 AMSOIL Biodegradable Hydraulic Oil exhibits high biodegradability and low aquatic toxicity, along with superior oxidative stability, low temperature performance and outstanding results in laboratory and extended duration pump testing. It contains antioxidants that ensure long oil life and foam inhibitors that promote problem-free operation. It is hydrolytically stable and ideal for use where water contamination is a problem. APPLICATION RECOMMENDATIONAMSOIL Biodegradable Hydraulic Oil is recommended for stationary and mobile applications using gear, vane and piston hydraulic systems operating under high pressure and temperatures up to 180°F. It should also be used where high biodegradability and low aquatic toxicity are desired. Typical applications include construction, logging and farming equipment, lawn and turf care or anywhere leaking, spills or ruptured hydraulic lines may present an environmental hazard. 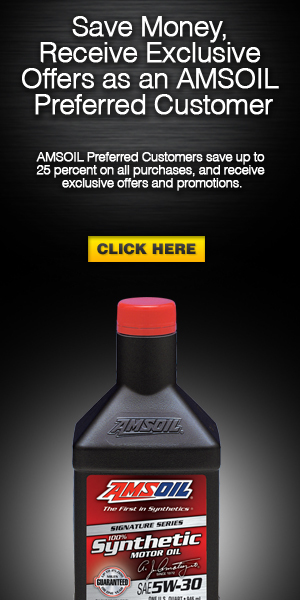 AMSOIL Industrial Lubricants are formulated to exceed accepted industry specifi cations. AMSOIL warrants that the use of its lubricants will not cause mechanical damage to any mechanically-sound equipment when AMSOIL products are used in full compliance with the company’s recommendations. However, the purchaser is responsible for determining if these specifi cations are adequate and proper for the intended application. The AMSOIL warranty is limited to lubricant performance consistent with indicated specifications. No additional warranty, expressed or implied, can be made. For additional warranty information click here.